This is the weather that we Mainers have been waiting for all year. The kind we dream about on the day after Christmas and we know it will be coming around in oh… about 180 days….. we hold on to that thought and when a day like today happens, we cry and cry…..ok, well maybe I am exaggerating, but I actually do cry when it snows… Where was I?? Oh yeah…Warm, long days, cool nights. Perfect for long evening walks after supper. Longer days means longer baking days. My perfect kind of day. When I turn the oven on and hubs comes in the kitchen and says, “Wow, it’s hot out!” and I snap back, “SHHHHHH, you will jinx us all with your complaining about it being hot out! !” I have been praying for this for months!! No complaining! I get over zealous when I am baking because I have a million ideas going on. I figure, everything is mis en place, keep going, like a bakery assembly line. But then I realize, who is going to eat all of this??? Also when food shopping. I think I went over board on blueberries and raspberries, how can that be a bad thing I ask you?? 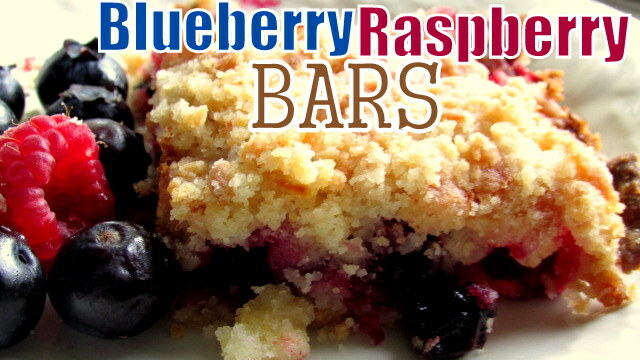 These bars are like a Blueberry- Raspberry – better – than- Pie- Dream. I love Pie, any kind of pie, but especially berry pie. I was raised eating pie as the best dessert you can ever have. These are better than pie because it is half the work of making a pie and all the flavor of summer. 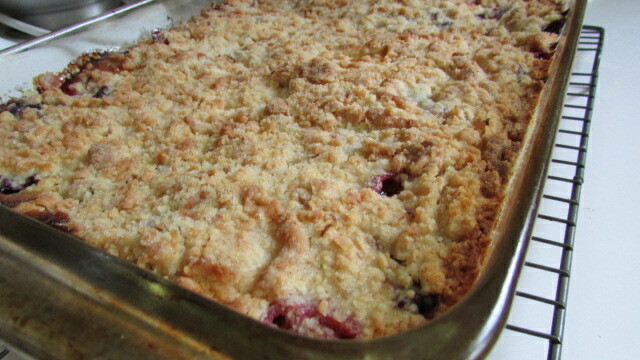 Those edges are crispy, buttery berry gooeyness, that you just want to last forever. You can slice them small or slice them bigger like some people do in my family, we won’t mention any names, but they are male. Preheat oven to 375 degrees F and grease a 9×13 inch pan. .
For the crust, in a medium bowl, stir together 1 cup sugar, 3 cups of flour, and 1 tsp baking powder. Mix in salt and lemon zest. Using a fork, blend in egg and butter. Press half of the dough into the pan to form the crust. In another bowl, stir together 2/3 cups sugar, lemon juice, and corn starch. Fold in strawberries and blackberries. Spread the berries over the crust. add remaining dough over the top of the berries. Bake for 45 minutes until top is lightly brown. Cool completely. Makes up to 24 bars. These bars really are OMG, wish I could bring some over to you! Loving this, I was having a craving already and now you have sent me over the top!! Hi Nettie, I’m putting these on my “to try” list for the 4th. YUM! Love that fruity combo. Oh my Nettie, these looks absolutely fantastic!!! 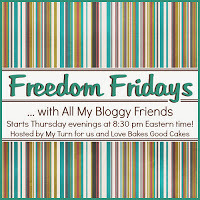 I prefer a pie over a cake actually and I love this kind of pie with berries and a topping. Looks so good you had me drooling over my keyboard. Loving this recipe! 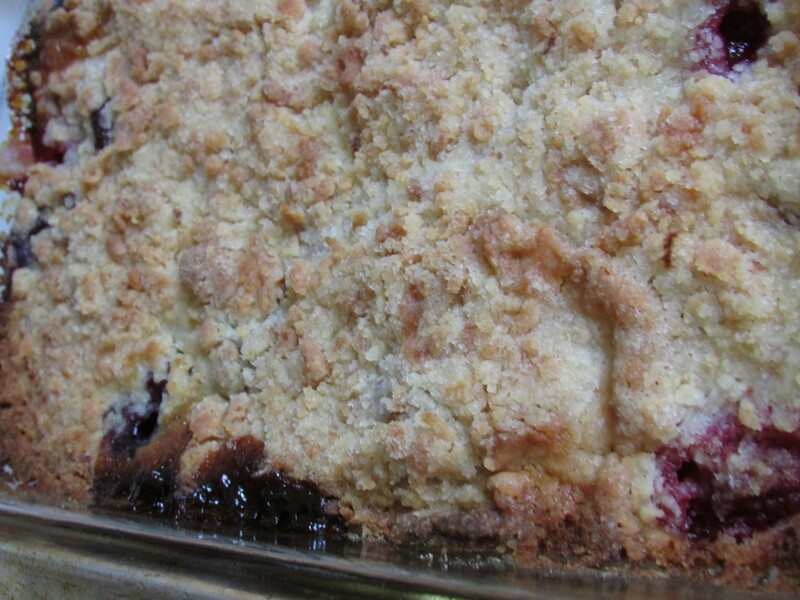 Blueberry Raspberry Bars seem like a perfect snack for me. Simple and easy to follow directions definitely make me happy.Will let you know how they turn out!! Blueberries AND raspberries? I’m in! These bars sound fantastic!! Pinning! Well, I will definitely cry hard when I experience snow here in the Philippines (since we don’t have snow here) LOL. Seriously I really love this blueberry raspberry bars. I’m going to try this out this coming weekend. Thanks for sharing.